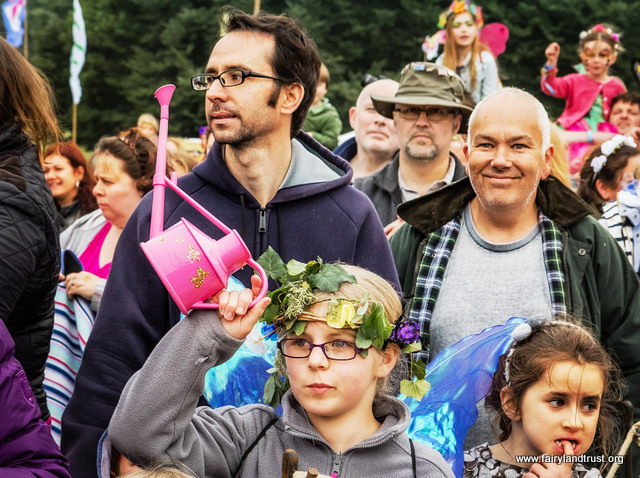 Visit our Bling Your Watering Can drop-in on the Main Lawn at the Fairy Fair to get help decorating it to Fairyland standards (£1/ can). Would you like to be a Fairy Gardener ? We hope so. 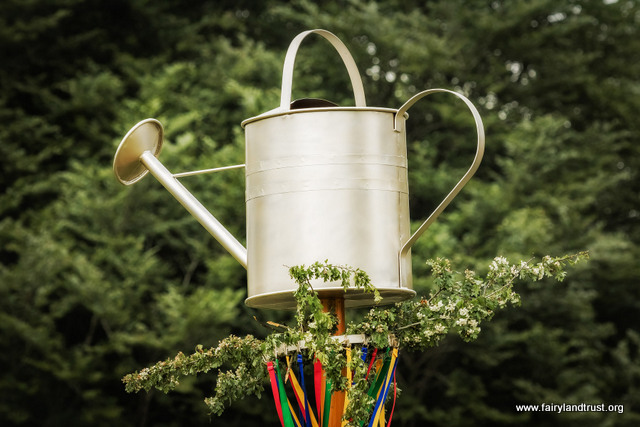 If you came to a previous Fairy Fair you may know that Watering Cans are the symbol of Fairy Gardeners. And of course not just any old watering can but a decorated watering can. This is how the fairies recognize you as a Fairy Gardener, and the secret sign by which Fairy Gardeners recognize one another. The Queen will lead an inspection of the Watering Cans. Her consort the King will follow along. 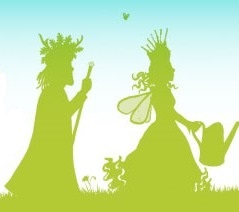 As is traditional, the Fairy Gardener will give her Report to the King and Queen and address the crowd. Everyone is welcome but those with watering cans are invited to be near the front. 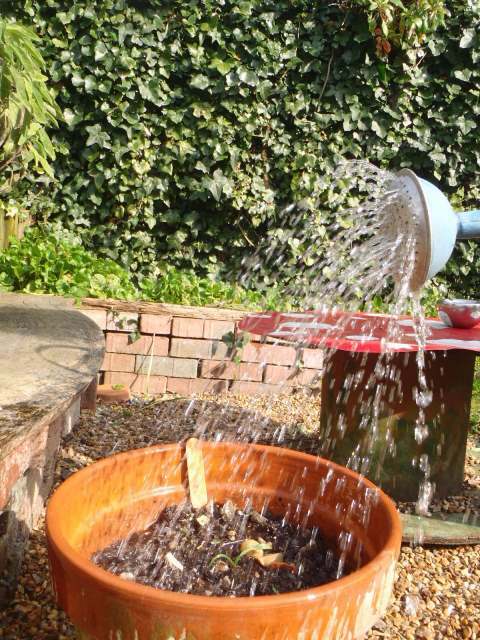 So before coming, please bling up your watering can with a swoosh of stars, flowers or other decorative features (but no plastic glitter please – see below*). If you are coming, get your adult to dig about in your garden shed and see if you can find a watering can to bring with you. 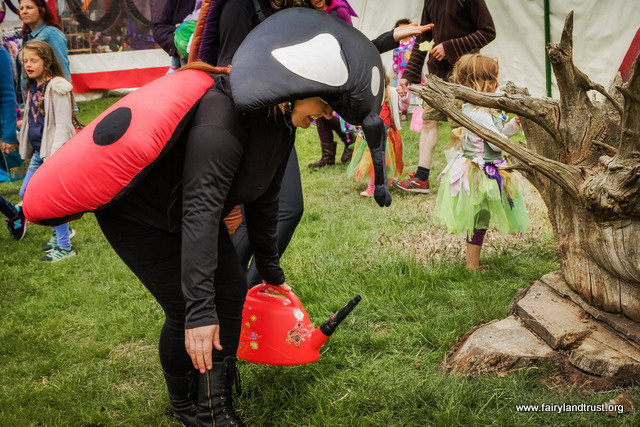 The Inspection of Fairy Gardening Watering Cans takes place at the end of the Fair (each day) as part of the Grand Finale. 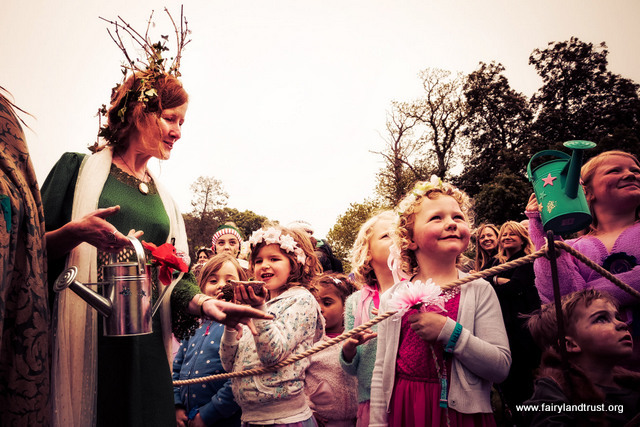 See a video of the 2016 Fairy Fair including the Finale, here. 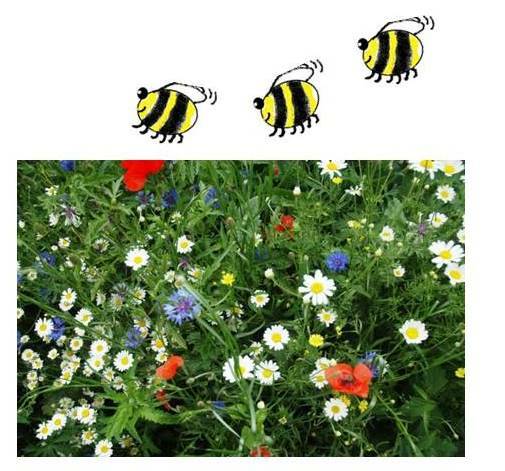 You may not be surprised to hear, that around this time of year, the Fairy Queen is very keen to make sure that there are enough wildflowers for all the bees, butterflies and other wildlife which need them for nectar. Plus of course for pollen and their favourite types of leaves to eat. Wildflowers, like all flowers, need watering; so she goes to her secret woodland cupboard to get her Fairy Queen Watering Can. Indeed, without wildflowers and Nature, there would simply be no place for fairies or other magical creatures. Then she’s off, usually taking the Fairy King with her, to tour the Kingdom and check that Spring is going as it should. 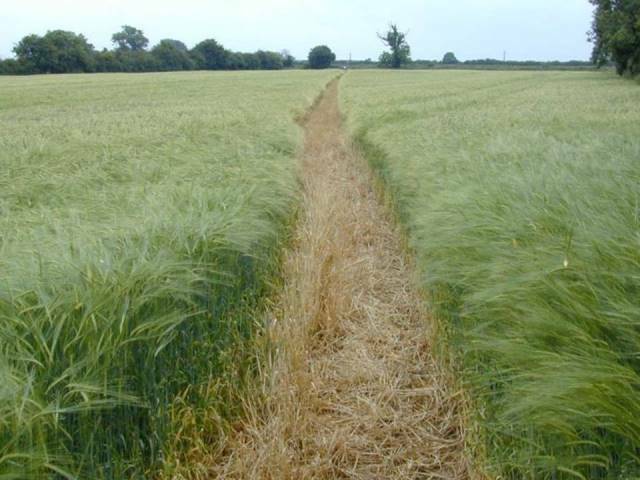 have been turned into fields like this, in which there are crops but no butterflies, moths, moles, crickets or other creatures. Plus of course, no fairies. Let’s not dwell on this but only note that the Queen turned to the King and said: “This is calamitous: something must be done !” “Yes” said the King. “If we do nothing then the human world will loose all its wildlife, wildflowers and fairies” said the Queen. “Indeed” said the King. “We must act !” said the Queen. “Quite so” agreed the King. “This is terrible. I shall consult the Head Fairy Gardener” said the Queen. “Right” said the King, for he was never lost for words. So she did. 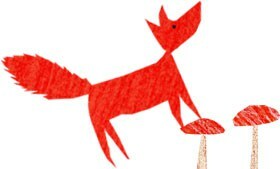 Soon the Head Fairy Gardener came back with a Report which pointed out, as by coincidence we have done in a previous blog, that while most humans do not own fields or woods, many of then do own gardens. 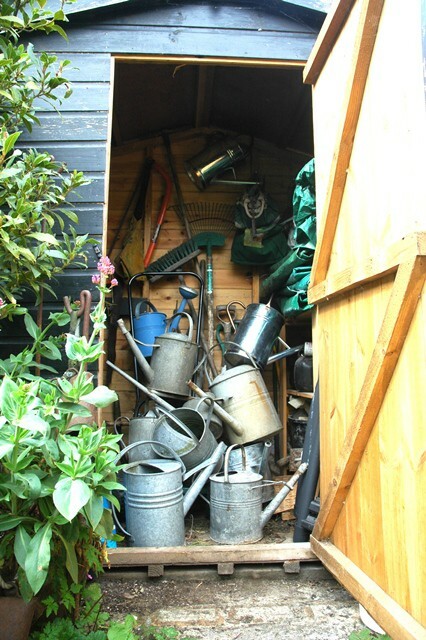 “So” said the Head Fairy Gardener, “something could be done, in theory at least”. “Yes yes” said the Queen. 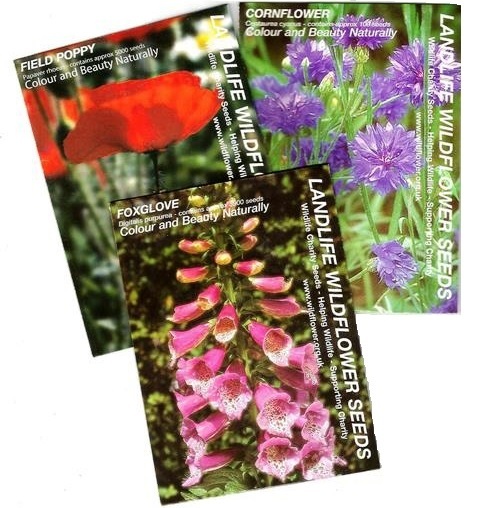 “So let’s get them to plant wildflowers in their gardens”. Seeing his opportunity, the King added, “Good idea”. The Queen thought about it. “What we need” she thought, “is a Sign that shows people are planting wildflowers and looking after them“. 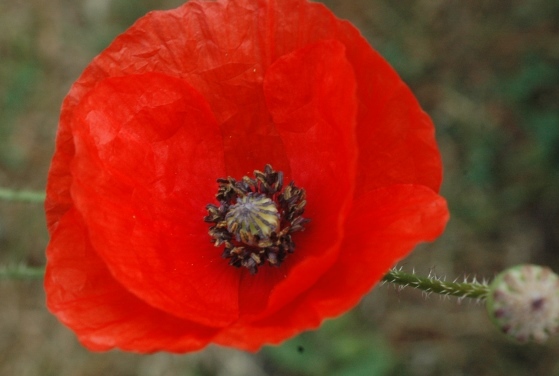 “When people plant wildflowers and put this Swoosh of Stars on their own watering cans” announced the Queen, “it will bring a bit of nature’s magic to their gardens. From this day forward it will be the mark of a true Fairy Gardener”. “Absolutely, my thoughts entirely” echoed the King. 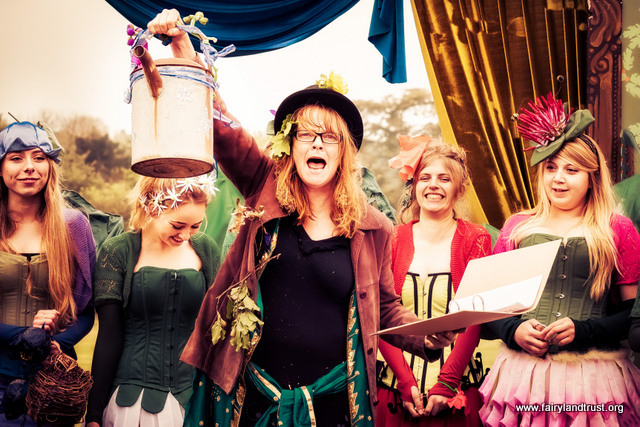 “As we always go to the Fairy Fair, we’ll launch the idea there” added the Queen, “The Fairyland Trust will help people bling their watering cans. Their lovely Flower Fairies will help. So can you, just make sure you wear your best trousers”. The King simply nodded in agreement. And with that the Fairy Queen sent off Fairy Gardening Watering Cans flying around the country to visit all the Fairy Gardens already planted, to make sure they have enough water. 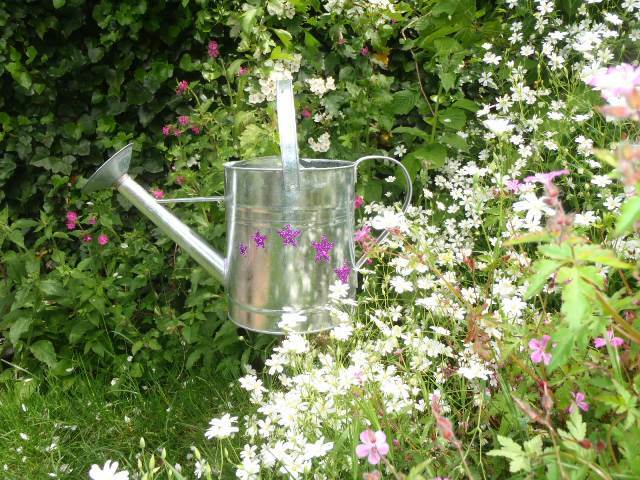 Watering Can with Fairy Swoosh recently seen in a small Fairy Garden with Stitchwort, Herb Robert and Red Campion. The Queen also instructed the Head Fairy Gardener to provide some Guidelines for human gardeners about how to bling their own watering cans and how to grow Fairy Flowers at home. 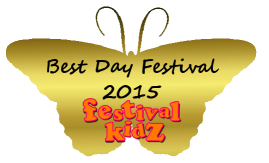 So it is that at the Fairy Fair, that’s what we will be doing. First of course, get your Fairy Gardening Watering Can and decorate it. 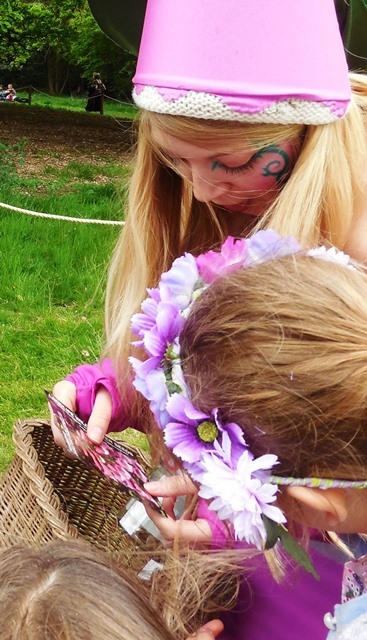 At the Fair, our Flower Fairies will be on hand to give you tips about growing wildflowers at home. Seeds are one option and they’ll have some packets you can buy for not much. See here for where else to buy them. You don’t need a big space. 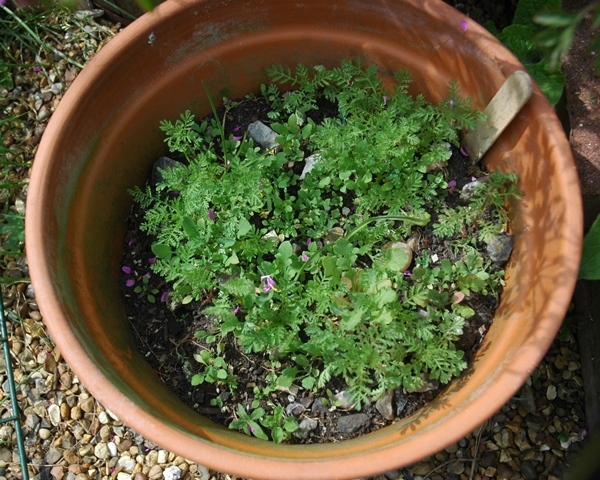 Even growing some in a pot can soon produce results and please bees and fairies, so long a you remember to water them. 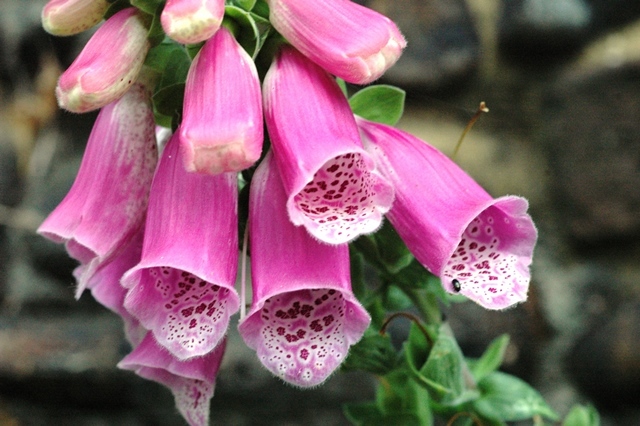 But you can also plant “plug plants” which are young plants with established roots (see here). 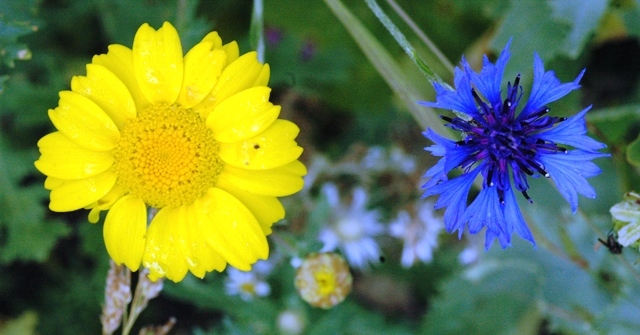 If we all planted wildflowers in our gardens we could make big difference. 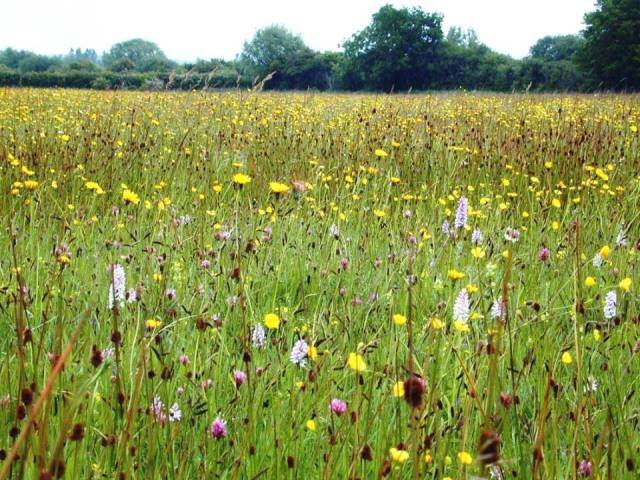 Just 4 square metres per garden could add as much wild-flowery-ness as half of all the traditional meadows now surviving in England ! 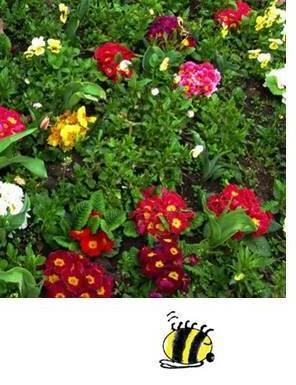 That would please a lot of bees … and fairies. (And the Fairy Queen of course). 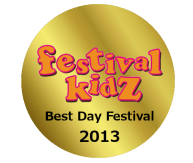 As you may know, the Fairyland Trust has always discouraged plastic of any sort at our events and in our Workshops but in recent years it has become apparent that plastic never ‘goes away’ but breaks up into very tiny pieces that in effect last forever (in air, soil, water and other places). This ‘microplastic’ is a real problem and like microbeads in cosmetics, plastic glitter is microplastic. So we have already stopped using it in ways which get directly onto the ground, and have redesigned our workshops so that only tiny amounts get used, held in place by glue. When we have enough funds we will buy some new bio-glitter which is not plastic, and get rid of plastic glitter completely. Alternatives for decoration which do not involve plastic glitter include: good old fashioned painting of stars, flowers or other symbols, attaching ivy or flowers from your garden (especially wildflowers) just before you come along, or using coloured sand and glue from craft suppliers. You may also buy your own ‘bio-glitter’ or ‘edible glitter’ made from sugar and food colouring. We cannot advise you to buy and particular product as many are new (see this advice from Shambala Festival which is going plastic-free). Best option is not to use glitter.